I own an entire set of the A&W Sizzle Stix fountain pens. They are a bit elusive to the fountain pen community. I cannot find information about these pens and no one is selling them. I did receive them as a gift from my dad and they were purchased during my childhood in the late 80’s to early 90’s. This pen is user friendly and a great workhorse. It’s a plastic body with a sturdy clip. It posts really well (if you’re into that sort of thing) and has a twist cap (which I prefer). Its nib is metal (I’m assuming steel or something like that) and it takes a basic cartridge that can be found most anywhere. 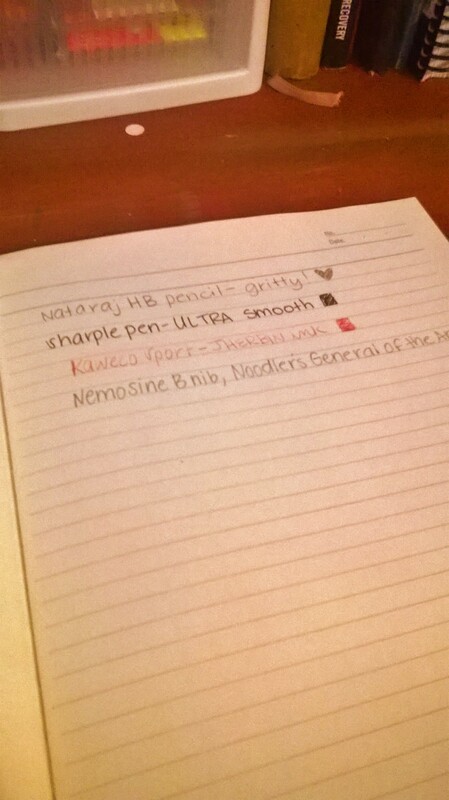 Plus, the pen and the nib are pink, so I’m reppin’ the 90’s like a prof. I wanted to share with you The Pencil Factory “American Made” Notepad. This paper is thick, creamy, smooth, and rich. It’s not quite fountain pen friendly, but it does well with gel, roller balls, and basic ink pens. It is, of course, extra friendly to pencils! There was a lot of ghosting and even some bleeding through the back. Mostly the bleeding was due to size of the nib I was using– a 1.1mm. However, I still wouldn’t recommend this paper if you are sensitive to less than perfection. Since the paper is only lined on one side, it wouldn’t really matter (to me personally…), but I know people that this would drive them bananas. It does not feather or smear or look bad on the writing side and aesthetically it is nice for wet inks and it is practical. Here I used some pencils and it was a huge improvement. They wrote smoothly, almost like writing on glass, and the graphite didn’t smear. Overall, if you’re a letter writer or a list maker, I highly recommend this paper. It’s sizeable enough to hold a lot of information, but portable enough to fold in half and stuff in an envelope, planner, or pocket. I love mini notebooks! 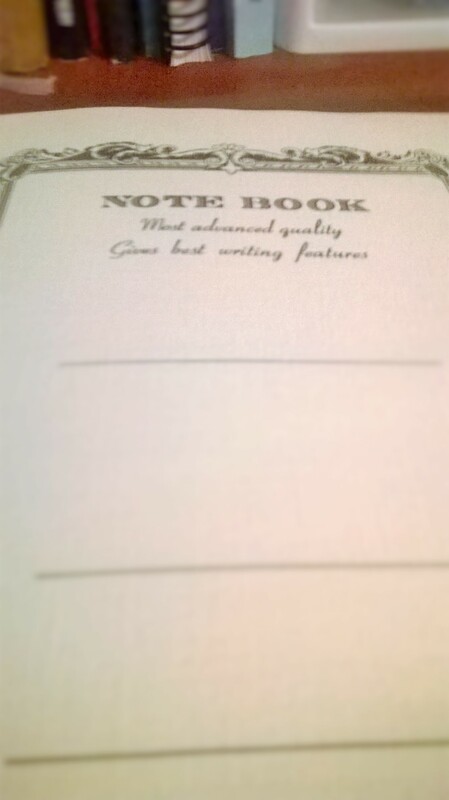 I especially love HIGH quality mini notebooks! It’s a great thing when companies that are known for making great products miniaturize those products to make them easily portable. Clairefontaine has reproduced its original notebook covers with a modern twist of the iconic French notebook. Collection 1951, combines Clairefontaine’s renowned satin smooth 90g paper and the timeless look of the original covers. It’s an exceptional collection, offering a high-quality vintage look! As they claim, Clairefontaine is the “best paper in the world for writing”. And I’ll be honest, it’s easily in my top three! I picked these minis up at The Paper Place in Austin, Texas. I bought them specifically for using with my Nock bi-fold and they fit perfectly! I was worried at first because the thickness of the minis are substantially greater than the New York Public Supply Co. notebooks I am currently using. Even using all three pen slots on the left side of the bi-fold the Clairefontaine minis fit well. I am on the go almost daily and having a decent mini notebook on hand really is a joy! 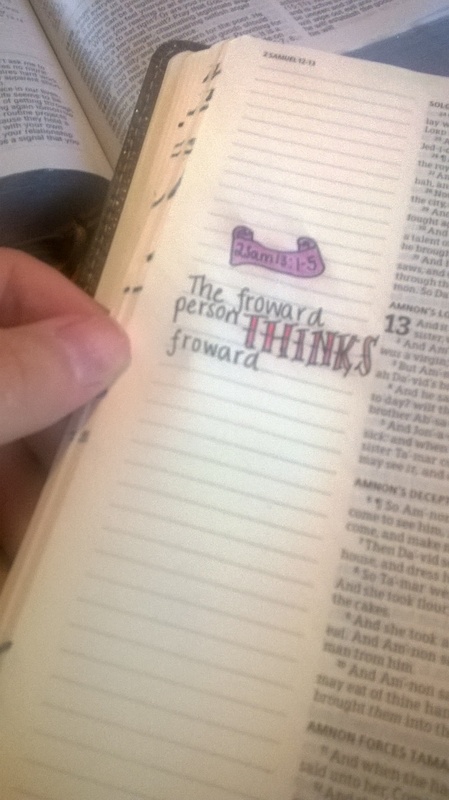 Last night, for instance, I left my sermon journal at home and had to use my mini-notebook for note taking. WIN! The Nock case is a wonderfully made piece! 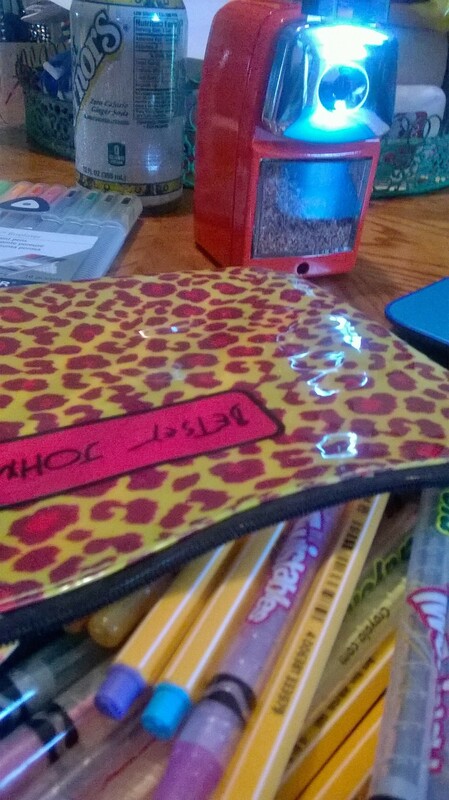 It fits really well in my purse, it’s durable, and it keeps my writing tools neat, organized, and stylish! The paper in the Clairefontaine minis is creamy, thick, and of course, fountain pen friendly. At only four bucks a book, I highly suggest picking a few up. They also make GREAT stocking stuffers for the pen lover(s) in your life! I have recently found myself getting into the habit of coloring. It’s relaxing, mostly easy, and stress relieving! 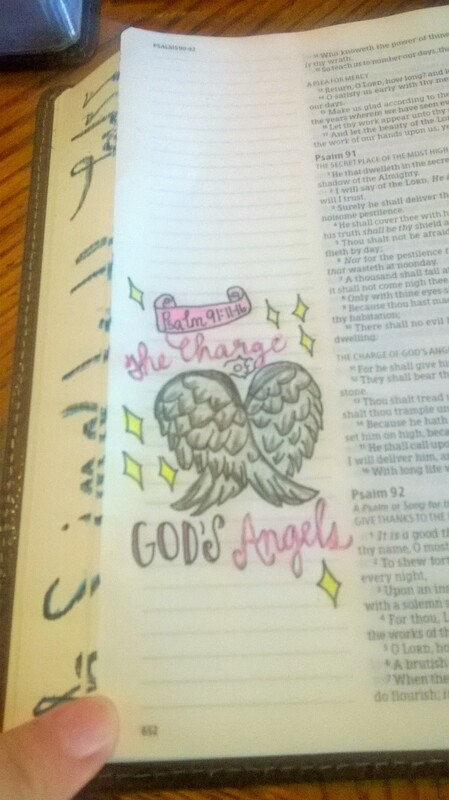 I have Lost Ocean and another water-y type coloring book, but I received some Christian devotional coloring books from Barnes and Noble that are really nice! “Color the Psalms”, “Beside Still Waters”, and “O, Holy Night- A Christmas meditative coloring book”. They don’t all use the KJV, but I haven’t found any that do, so I am taking what I can get. Today I want to show you the tools I am using to color. It’s a great assortment and most are relatively inexpensive, and if you have kids you may already have them lying around the house! 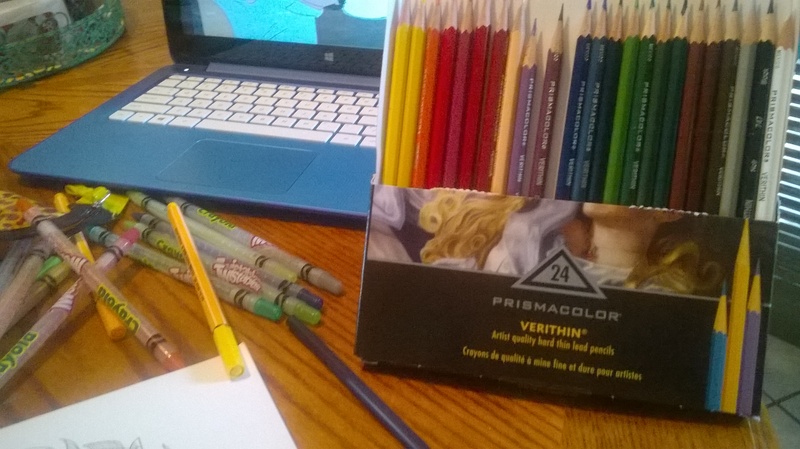 Prismacolor Verithin colored pencils are great for tracing, outlining, and shading. They are on the low end of the Prisma-pricing at about $34.99 at Michael’s. The person that bought these used a 50% off coupon that was on the top of a recent receipt. Staedtler TriPlus fineliner porous point pens– extremely useful for those teeny tiny sections of adult coloring books. They work really well for highlighting and shading! These aren’t too expensive. Once again, they were purchased at Michael’s using a 40% off coupon. They sell for about $18.99. Basic Crayloa markers (thin). Good ‘ol Crayola brand is still one of my favorite brands to use for coloring, doodling, and journaling! 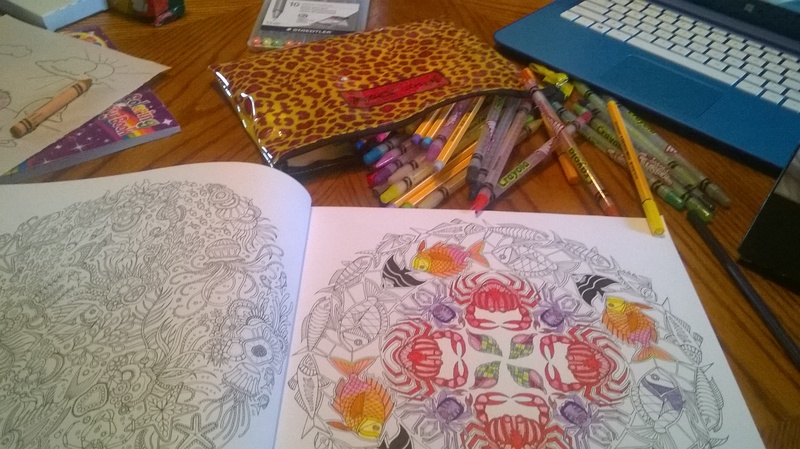 Crayloa Twistables colored pencils are perfect for adult coloring books! The color is rich, even, and easy to blend! The Crayola twistable line is one of my favorite product lines from them. This bag here is full of more twistables plus Stabilo fineliner markers, glitter pens, Sharpie pens, and Gelly Roll metallic pens. 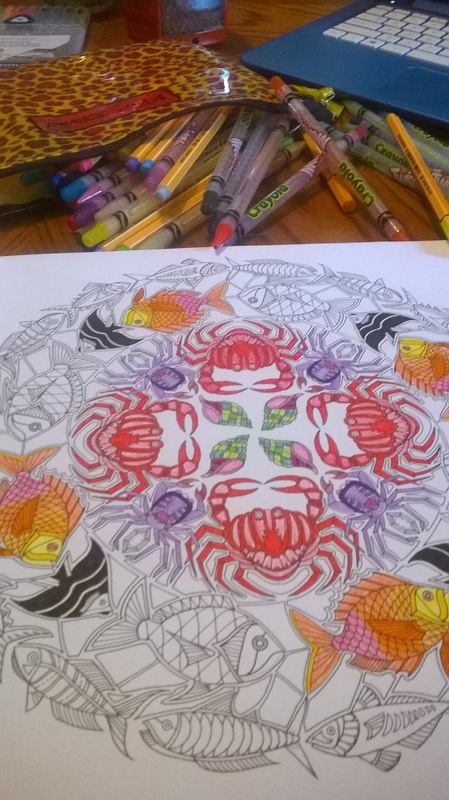 I highly urge you to try this adult coloring book thing. It has really helped me with stress, anger, sleeplessness, and boredom. Coloring books are typically priced from $6-$20. Most pages are single sided so you can easily tear them out and even frame them! But I’m not very creative, you say! But I can’t draw to save my life, you say! Well, neither can I! What I am good at is Pinterest and using a pencil with a very, very good eraser. I bought my KJV Journaling Bible at Family Christian Bookstore in Austin, Texas while visiting my dad a while back. 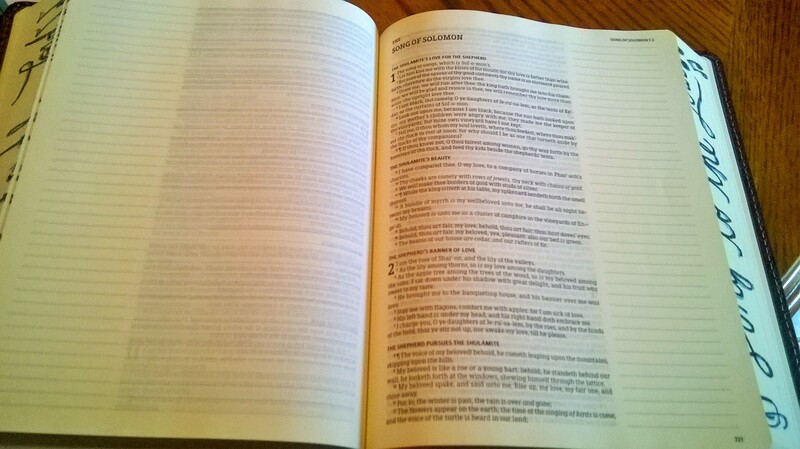 These bibles run about forty bucks on Amazon, but I was fortunate to grab mine for $12.96 on sale. I even got the KJV Life App Bible (usually $80-90 for $39.99!!). This is a lay flat bible with a sturdy bonded leather cover. I don’t usually like hard covers, but since it’s a lay flat bible it isn’t that big of a deal. The paper is a creamy off-white color and smooth to the touch. The paper isn’t quite as thin as onion paper, yet it is still pretty thin. I was skeptical at first about bleeding and ghosting, but so far I haven’t had too many issues. 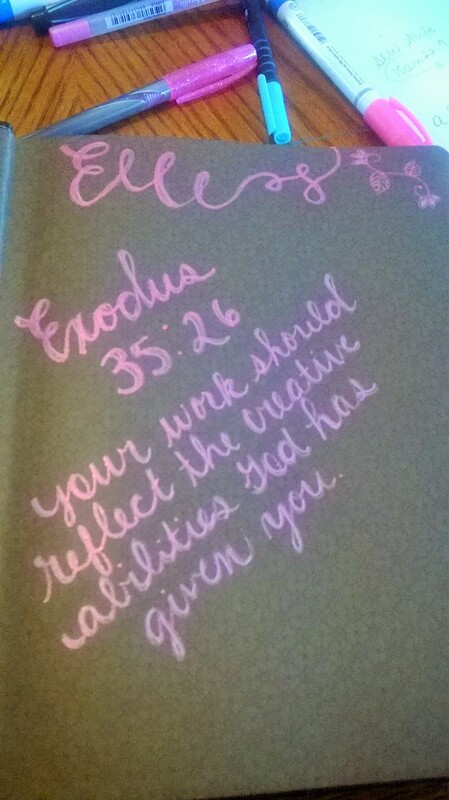 I don’t use marker for the majority of my journaling. I’m using PrismaColor Verithin colored pencils. I don’t journal every day, but I am trying to. 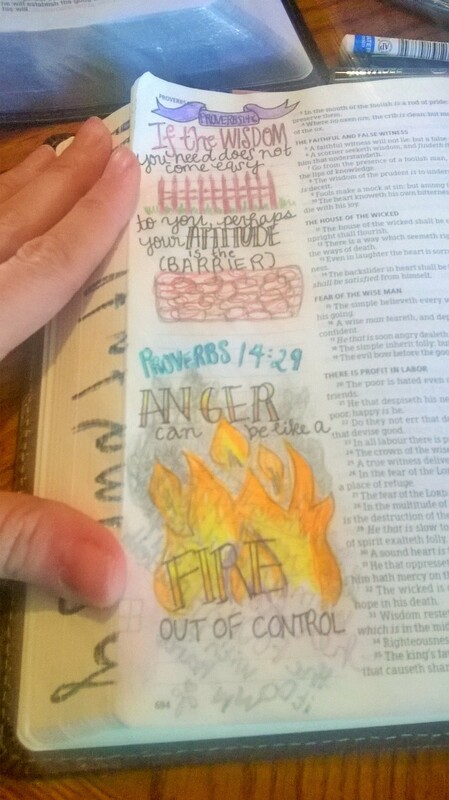 I do like to journal during sermons (archived– not during church, lol!) 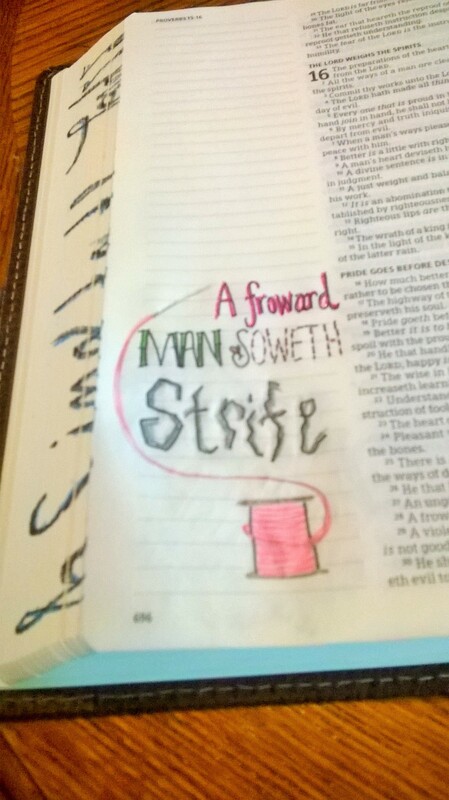 Right now I am journaling through Proverbs. 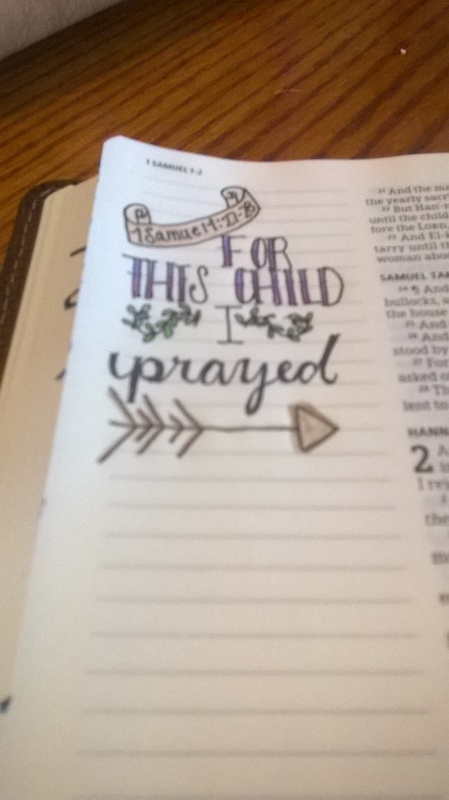 This verse (1 Samuel 1: 27-28) is especially important to me. I had a late term miscarriage last year and this verse is what got me through it. Even when I start to get sad (a lot of women are having babies all around me!) and down about losing Arrow, I can still refer to this verse and it fills my heart with joy! 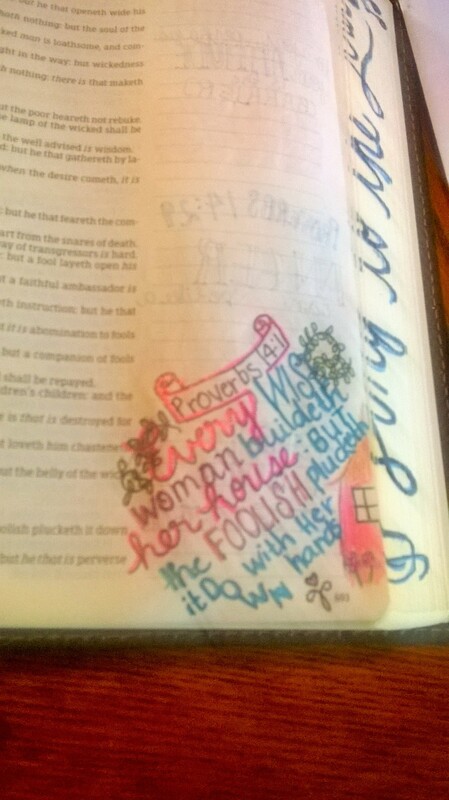 More Proverbs application complete with doodles. 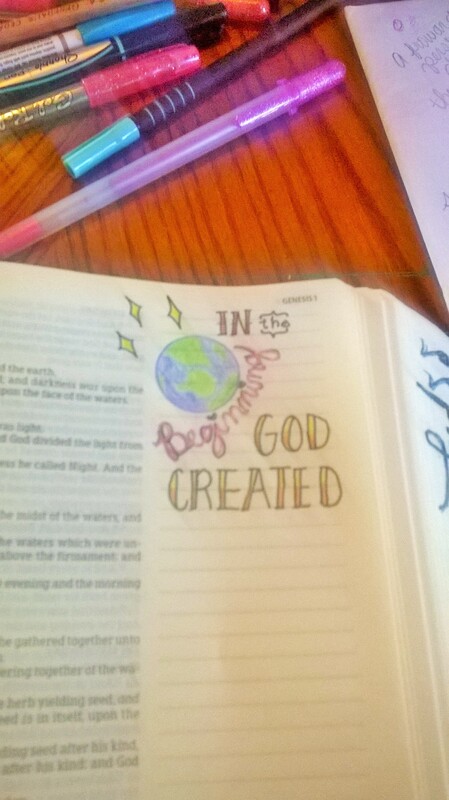 You don’t need to be uber crafty to begin Bible journaling. You just need a few colored pencils (Crayola Twistables are great for this! ), a pencil, a Bible, and some time alone with the Lord. Pinterest doesn’t hurt, either, lol. 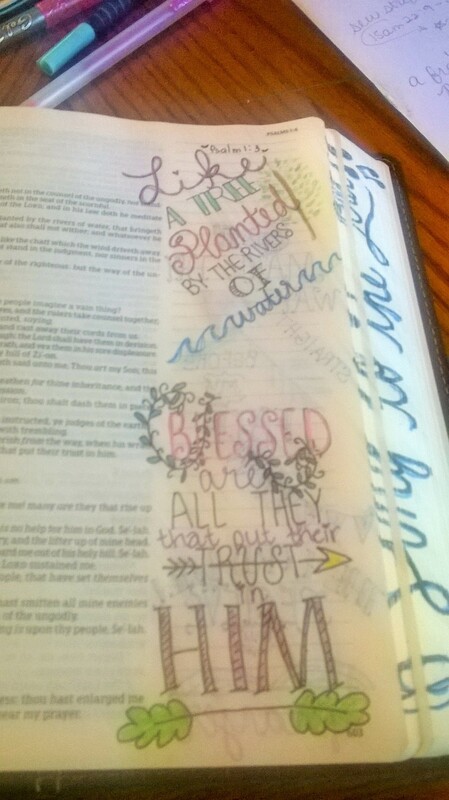 There are lots of great beginner Bible journaling links on Pinterest that have helped me get a vision for journaling. Now that I am getting the hang of it I have developed my own vision and it’s becoming a lot of fun instead of nerve racking that I’ll mess up! While visiting my parents this past week, my dad gifted me a few APICA notebooks. I have been wanting these for a while and have seen them on JetPens.com, Amazon, and have even read reviews about them on other blogs. I wanted them for the size. 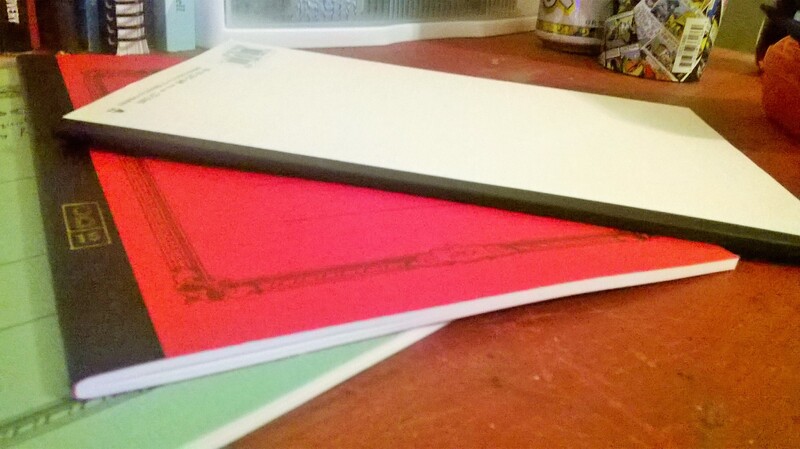 I like flat notebooks (like the Kokuyo Campus notebooks) that can easily be slid into a bag, purse, or folder. Since I am on the go a lot with my kids, slim notebooks are primo! These are ultra slim. Maybe slightly bigger than a quarter of a centimeter. Very easy to stash them in a messenger bag, purse, or even in a folder. The covers are soft and flexible, so they are great for using in areas where space is limited – like the driver’s seat, the library, church services, or even road trips! The paper, which is ultra smooth and creamy, is what set these notebooks apart from say, the Kokuyo books. The lines, which are a bit wider that college rule, but still slimmer than wide rule, don’t go the entire width of the page. There is room for small notes and (for me) doodles, bullet points, or pics. 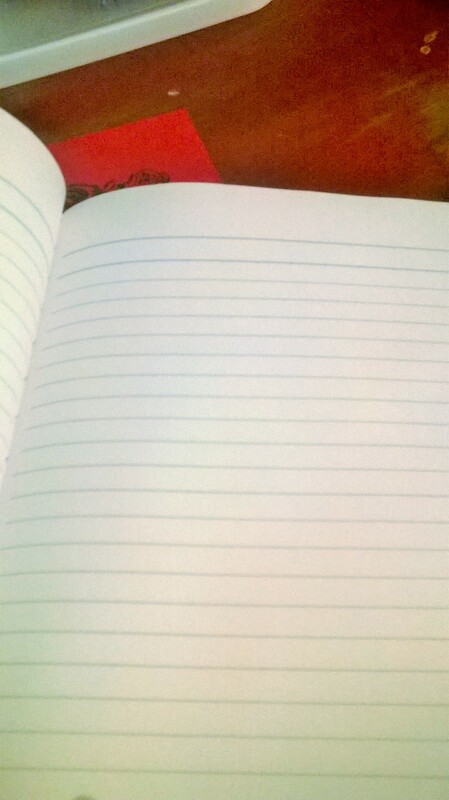 The top has a “No.” line and a “Date” line, plus double bold lines above the start of the lined paper, perfect for titling, something I find useful during my day for easy reference and locating. I used a Nataraj pencil (HB) and was surprised at how gritty the paper felt. Not a bad quality, just a surprising one! Next, I tried a Sharpie pen, which felt like writing on glass. 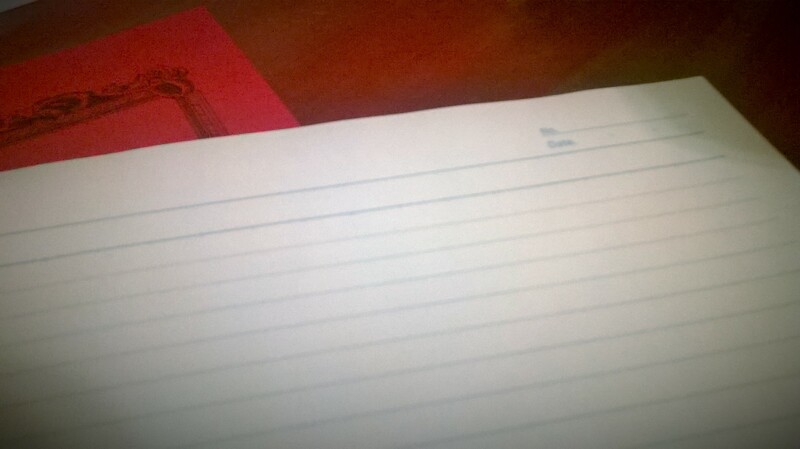 However, it is very visible on the back of the page, something I find really distracting when I take notes. Then I tried several fountain pens. 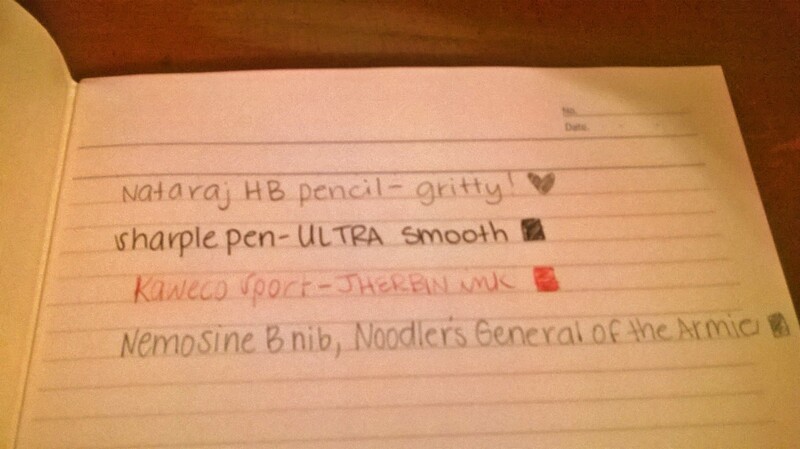 My first pen was a Kaweco Sport using J. Herbin Rouge Caroubier ink. Once again, I was surprised at the resistance of the paper. But, the ink did really well on the page. Next I tried a Nemosine broad nib and it was a lot smoother. The Kaweco is a fine point, so that could have a lot to do with the gritty feel. I used Noodler’s General of the Armies and it was like writing on air. I didn’t have to work very hard to get the pen to move across the paper. Great notebooks at a great price! One of these will set you back roughly $4.50 or so. Not bad!